Arthur Lloyd Fletcher; 1963; reprinted in 2009 with greatly expanded index; hardback; 431 pages. 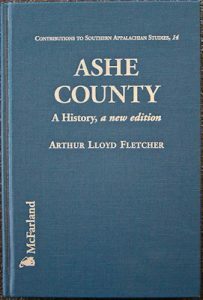 An essential reference book for those interested in Ashe County’s history. Colonel Fletcher was commissioned to write this book by a group of Ashe County citizens, and he completed the task after a great deal of research and communication with many people. Included are lists of elected and appointed government officials, religious and civic organizations and their leaders, as well as information about the county’s institutions and its commercial activities. $44.99 On Sale! $24.99 Get yours today!